Theodora Palaiologina died at Stameron in November 1429, in the throes of labor. "She left behind," wrote Sphrantzes, her husband's close aide, "much grief for her husband and for all of us, because she was really lovely." Kleope Palaiologina died in April 1433 at Mistra from the results of childbirth. "She was outstanding," wrote Chalcocondyles who knew her,"for her beauty and all other seemliness." In an eloquent eulogy, Kleope's doctor, Demetrios Pepagomenos, said that her residence among them had made them better, and mentioned an infant born too soon, a daughter, her companionship with her husband. When their father-in-law, Manuel II, whom neither woman had ever met, visited the Morea in 1415, Pepagomenos was with his suite. He was a specialist in gout. 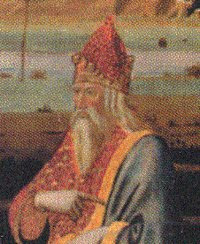 He was left in Mistra to serve Theodoros II as court physician. The author of Mazaris, a book of upper-class male humor written for Theodoros, was also traveling with Manuel. He said Pepagomenos was a skilled poisoner, and had even poisoned himself and someone's secretary by mistake. There are a lot of doctors in Mazaris, and the author gives them all a rough time. Byzantine humor when not scatological involved satire at the expense of others who were usually present. Humans have always and ever joked about doctors killing their patients: we need not take any of this as courtroom evidence. This was written as humor and the Mistra intellectuals were probably rolling on the floor, howling with laughter. We are told Pepagomenos had two sons. The younger, Theodosios, nicknamed "Little S**t," was driven by ambition to rise at court, while the older, nicknamed "Lizard Eyes," had also entered the ranks of licensed killers. This, too, was found hilarious. Pepagomenos means "frozen." Mazaris missed a chance to joke about it. That is irrelevant here. And the eulogy makes it difficult to connect the man with any idea of frozen. What is relevant is that he was Kleope's doctor. Given the intense conservatism of the last Palaiologoi in regard to the aides they employed, it is very likely that he was also Theodora's doctor. And most medical knowledge and practice was based on sources 1500 years old. In Florence in those years, one could expect one maternal death for sixty-nine childbirths. Ultimately, one woman out of five would die as the result of childbirth, But here in the imperial family, we have two maternal deaths for three childbirths. 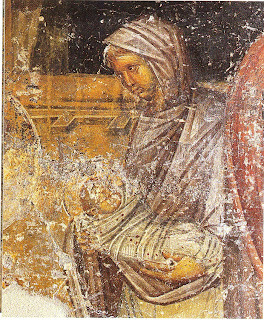 Kleope had successfully given birth to a daughter in the winter of 1428-1429. One of her letters indicates that she was worried about the birth, but there is no way to know whether she knew of a problem, or whether it was normal concern. Her mother had died in childbirth, after at least five successful pregnancies. Still, Kleope had that intimate loss behind her concern. That first birth went well: she had a daughter Helena who in turn had daughters, Charlotte and Cleope. There is evidence over many centuries that a radicalization of death rates happened whenever men moved into midwives' territory, and got hands-on where midwives knew better than to interfere. A fine book, A Midwife's Tale, based on a diary written in the early 1800s, before penicillin and before the germ theory of disease, records a single maternal death for Martha Ballard out of 1000 deliveries. It also relates what happened when a doctor settled in the area and the status effect drew patients she had successfully delivered to him, a decision. often taken by the husband. All this may be traducing a good man. Kleope and Theodora might well have died without him. We cannot blame Pepagomenos for a premature birth, but it was not a good thing to be an imperial lady in the medieval Morea. Old images of Nauplion raise more questions than answers. Take the column. In 1834, just after the capitol of Greece had been moved to Athens, a German artist produced this watercolord sketch (left) of the main plateia at Nauplion, showing a column. The column stands beside a former mosque, and has the base of a minaret, but the rest is a fluted Greek column, and a fluted column of extraordinary size. This image was much reproduced in various forms. The same year, another German artist produced a sketch of Ag. Giorgios -- a former mosque -- at another plateia, with this same column and base beside it (right). This is what artists did then, before, and after -- cut and paste, rearrange, enlarge, blur -- to make their point. And in both of these sites, remnants of a minaret base can be located, but another contemporary image of the first site shows no base or column. In front of the cathedral [Ag. G.] facing our house is, as I told you before, kind of a loggia, 3 doors open into the church, at one side is the bell tower, surely unique, like a top decoration of a cake, 2 bells hanging toneless between the little columns, a piece of string attached to them is just hanging down and tied to a nail, even small street urchins can reach it (to my despair). Behind the campanile rises a Turkish minaret of the same height, broken down to half size so as not to darken the campanile completely. The question, one question, is, does this column have anything to do with the huge column that appears in the Camoccio image? It is the first known image of Nauplion, from 1571, much used in this blog already. 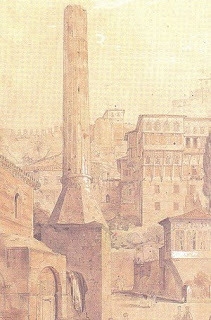 Camoccio did not commit himself to the type of column, and though there is a crescent on the column, he shows no mosques or minarets. 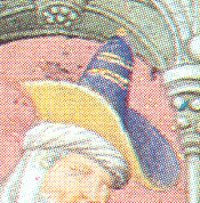 The Ottomans controlled Nauplion, but he was working from an older Venetian image, adding crescents to indicate the situation. He never actually saw Nauplion, so there may have been a column in the picture he copied, or he may have reasoned that Greece has columns, so he should include one. Except that he didn't include such columns in his other images of former Venetian cities in Greece. So one suspects an earlier artist drew the column first. 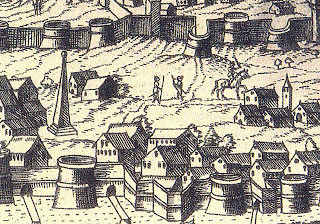 No source before 1571 mentions such a column, but sources before 1571 hardly mention any structure but the defense walls. 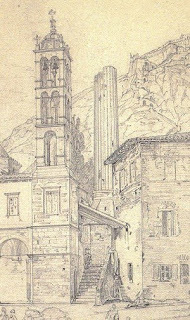 In fact, it is almost a certainty that an earlier artist produced a column because an image drawn a year earlier by one Zenoi ( a Greek living in Italy?) shows a construction in the same position, but one apparently borrowed from an image of the Hippodrome in Constantinople. The Hippodrome had assorted columns and constructions down the center, and presumably this attenuated pyramidal shape is what could be expected "over there" in Greek-speaking lands. 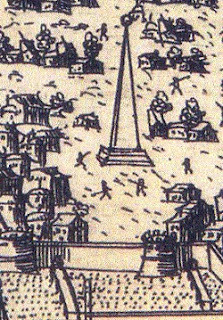 Italian artists took to Zenoi's idea, rather than to Camoccio's, and Valeggio employed it in 1576, making the column-pyramid a little more vertical and giving it some tiny people. Rosaccio used it in 1598, working both from Camoccio and one of the other pyramid people. He replaced the tiny people with helmeted soldiers and added a rider with helmet and sword. None of the written sources ever got around to mentioning a column, or a pyramid. 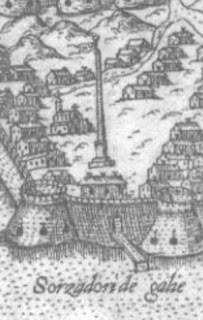 A whole slew of Venetian images of Nauplion came out of the 1686 reconquest (see the previous blog) and the subsequent thirty-year Venetian Occupation. While these often showed minarets, none of them showed a column. 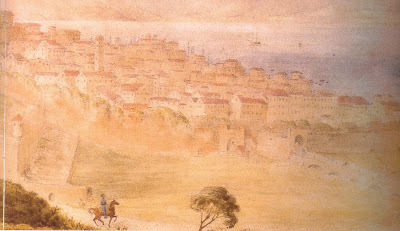 In this excerpt from a 1839 watercolor of Nauplion -- a huge blurry watercolor from a vantage point that never existed of a city with a degree of grandeur that never was-- Skene paints a tall tower on the slope of the hill. This tower has windows, and rises five stories above the three-four story houses around it. No pre- or post-Independence sources on Nauplion -- and there are a lot -- mentions a tower, or column, or pyramid. 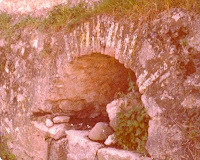 Thirty years ago and more, cycling home on the back road from Tiryns, I came across a wall behind the bed of a winter stream, with cannon embrasures, such as you see in the picture to the right. This year I found it again. 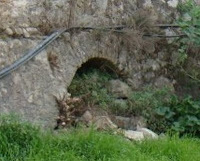 The picture on the left shows that the ground level is a bit higher, but that the big stone on the right has not been touched. The stonework looks a lot like the embrasures on the fortress of Palamidi, which means that this wall was built by the Venetians about 1700. Thirty years ago there was also a small Venetian-built chapel to Ag. Pareskevi, and well-posts that looked remarkably like the little obelisks on the Venetian staircase up the front of Akro-Nauplion. I assumed it had been a Venetian estate with its own fortifications, and on occasion wondered just what two cannon and the wall were supposed to defend against. My last day in Nauplion, I bought a splendid book, The Nauplion of the Foreign Travellers by Aphroditi Kouria, and on the bus back to Athens discovered in it three Venetian maps showing the troop disposition of the 1686 Venetian conquest. All three of those maps showed a zig-zag advance defence wall for the conquest. This is a detail from one of the maps, and I will just comment in passing that the three cypress trees are still there -- you can see them far to the left of the road, coming from Argos, just before the high-security prison. Here is another view of the wall in relation to Nauplion -- more or less -- and notice the hill on the right. A couple of things to notice here, before we get back to the wall itself. Behind the wall are little rectangles showing the disposition of troops, there is a glimpse at bottom left of the Venetian fleet at Karathona beach, and at the bottom right is the beginning of an alphabetized list of the military units referring to the little rectangles. This is a German map: it lists Papeliner, Maltezer, Sclavonier, Bataillon Italianer, Bataillon Saxen, and so on. The Venetian map lists Maltese, Papalini, Sassoni, Venetiani, Fiorentini, Milanesi, and marinari. This was a massive effort, intended to recreate the Venetian empire lost to the Ottomans, and it was led by a Swedish count Königsmark. After accomplishing Nauplion, the army went to Athens and a gunner from Luneberg blew up the Parthenon. These maps are not perfect on geography. They are propaganda maps showing the various participants in a victorious, and excessively brutal enterprise, but they are good enough on the important details. That is the hill at bottom left, Profitias Elias beside the security prison. The green line makes a zag and a zig and follows the line of the stream to a white blotch which is where I photographed the cannon embrasure. From that point the stream continues distinctly visible in the aerial view, but that is all of the zig-zag I have been able to find so far. Prison construction would have obliterated anything to the left. The wall that I know runs between the two parallel roads on the right. I am proud of this discovery: wall, maps, photograph. The next trip, I will walk that zig-zag and see what happens, unless someone reading this does it first and writes me. Please send photographs. 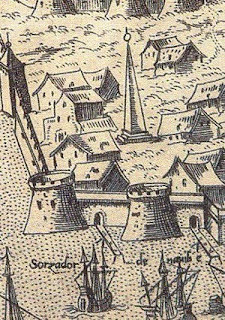 On 17 December 1432, Bertrandon de Broquière went to Ag. Sophia for the service of the Three Hebrew Children in the Fiery Furnace but he spent the service watching John VIII with his mother Helena, his wife Maria, and his brother Thomas, Despot of the Morea. Actually, Bertrandon wasn't interested in anyone but Maria, a "tresbelle dame." He thought she was a honey. The Empress rides astride, with two stirrups, and when she desires to mount, two lords hold up a rich cloth, raising their hands aloft and turning their backs upon her, so that when she throws her leg across the saddle no part of her person can be seen. I went all day without food and drink, almost to vespers, very late, to see the Empress who had rested in a residence nearby which seemed to me as beautiful as a church, to see her come out and how she mounted the horse. She only had with her two woman and two or three elderly men, and three of the kind of people the Turks have to guard their women. When she came out of the residence someone brought a bench from which she could mount and then they brought out a very beautiful roncey draped with rich and beautiful bardings. Going beside the bench, one of the elderly notables took a long mantle which she carried and then went to the other side of the horse and raised up the mantel with his hands as high as he could. She put a foot in the stirrup and then mounted the horse like a man, and then he threw the mantel on her shoulders. At the entrance to the Palace . . . is an open loggia of marble with stone benches round it, and stones, like tables, raised on pillars in front of them, placed end to end. Here are many books and ancient writings and histories, and on one side are gaming boards so that the Emperor's house may always be well supplied. Inside, the house is badly kept, except certain parts where the Emperor, the Empress, and attendants can live, although cramped for space. A little more can be said about that hat, but only a little. Extensive hat-searching turned up three images of pointed Greek hats. 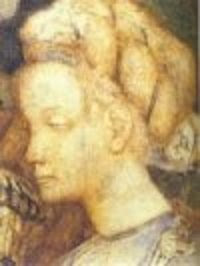 This first is from an early 15th-century Italian painting which I have not been able to identify, but it is surely based on an impression of Manuel II when he was in Italy and Paris between 1399 and 1402. Artists were fascinated by Manuel and his hats, the way the Italians were fascinated by John and his hats five years after Bertrandon saw the hat with golden feathers. They took up Manuel's beard and curled hair and imperial outfits with great enthusiasm, using him to portray ancient philosophers and wise men and one of the Three Kings. 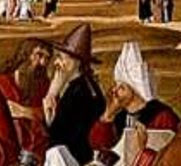 There is another pointed hat, found in the Très Belles Heures, in another image of Manuel, when he was visiting in Paris. Only one other pointed Greek hat has turned up for me, painted by Carpaccio more than eighty years later in St. Stephen Preaching at Jerusalem, but no one would wear it with golden feathers and ruby earrings. I am seeing Maria's hat as being made of elaborate fabric like that of the philosopher-king, but of the style of the Belles Heures which seems much more suited for riding. I have already used the picture of the lady above to represent Maria. 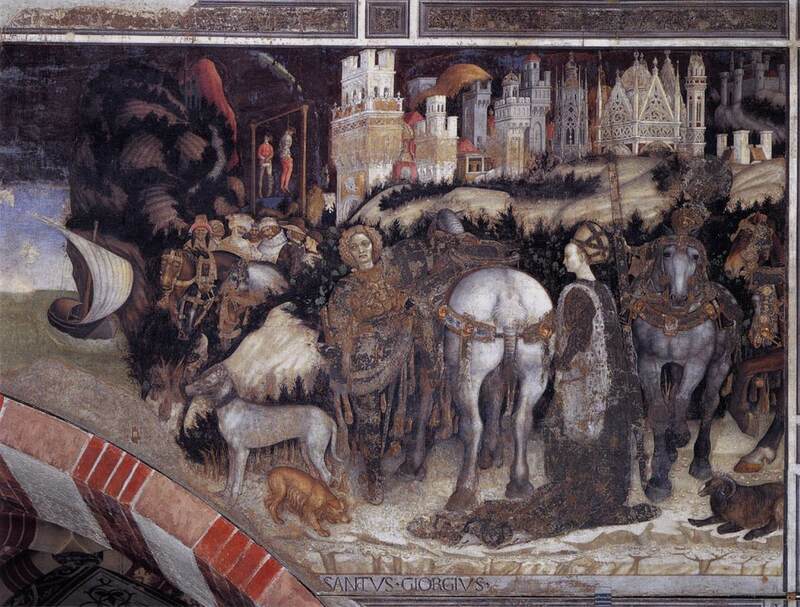 It is by Pisanello, and appears to be the same lady as the Princess in his fresco of St. George and the Princess of Trebizond. She, too, is young and fair, almost as if seen in a dream, and does not look at all like young women in Italian paintings. Pisanello drew, modeled, and painted John extensively, and I like to think John had a portrait of Maria with him. ** Go here for a little more on Maria's wardrobe. "With a needle of dolphin"
This blog began under the arbor just over a year ago. Since then I have spent ten months in Athens, with a month in Nauplion, and weeks traveling in the Morea. Now I am back to the arbor again. We are cooking dinner early today, before the heat becomes too weighty, for Ben from Athens. We have had Athens temperatures here this week, higher than Athens -- in the high 90s rather than in Seattle's accustomed summer mid-70s. But there are breezes and we will eat under the arbor with the bunches of lavender drying, the grapes two weeks from ripening, the dolphins from Nauplion. and a cradle for children yet unborn. was our whole world was our whole life. if we used to be bitter – hey! The town has a memorial to Gatsos, an exceptionally stiff bust with the sides flattened as if to assure the viewer that this poet and compulsive gambler had finally been compressed into the respectability of a mortgage banker. Gatsos is dear to me, I have translated all his poems, and this bust is painful. Still, the bleakness of Asea had something to do with the most evocative lines of his poetry, possibly the most famous, and it was these lines that inevitably came to me as I watered the flagstones under the arbor. a little water for the dust . . .